Elaine’s highly anticipated sophomore CD was recorded, mixed and mastered by engineer/owner, Scott Steinman, at Studio Media in Evanston in the summer of 2014. The recording features a roster of world-class jazz musicians: pianist Dennis Luxion, bassists Jake Vinsel and Jim Cox, drummer Jon Deitemyer, guitarist Andy Brown, trumpet player Art Davis, trombonist Russ Phillips, saxophonist Chris Madsen and jazz vocalist Paul Marinaro. Read the review in Listen Here Reviews! 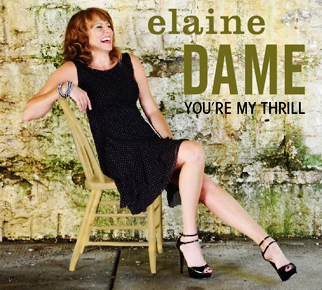 Elaine’s highly anticipated sophomore recording You’re My Thrill was released on December 1st, 2014, with a CD release event at the legendary Jazz Showcase. My debut recording Comes Love was released in 2005 to wide critical acclaim and worldwide radio play on Chicago’s own blujazz record label. The album features an all-star lineup of Chicago jazz musicians: pianist Jeremy Kahn (featured on Marian McPartland’s “Piano Jazz” on NPR), bassist Rob Amster (Kurt Elling’s long-time sideman), drummer Tim Davis, trumpet player Art Davis, legendary violinist Johnny Frigo and guitarist Dave Onderdonk. Read what the critics in the industry had to say about Comes Love.